In 1943 Broadway was forever changed when the iconic duo Rodgers and Hammerstein debuted their first musical as a writing pair. Innovative for its time, it seamlessly intertwines the stories of two suitors battling for the affections of an innocent frontierswoman and that of the plucky Ado Annie weighing her options between love and desire. 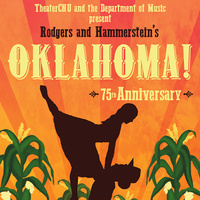 Enjoy this golden-age musical as we celebrate the 75th anniversary of Oklahoma!